After our dentist in Monroe refers you to an oral surgeon who specializes in wisdom tooth extraction, you might discover that the process will involve the removal of only one wisdom tooth or complete wisdom teeth removal. Although surgeons provide recovery instructions, preparing ahead is critical to success. The following tips can help you deal with these symptoms better for a faster recovery. The first few days after surgery offer up a lot of distractions that can make you forget the important things you need to do to heal properly. Create a whiteboard list and post it wherever you plan to rest at home as a reminder. The list should at least remind you to open and close your jaw regularly to prevent it from locking up, take anti-inflammatory painkillers on schedule, use cold compresses and rest with your head elevated to reduce pain and swelling. Additionally, outline the foods you’re allowed to eat on each day of your recovery. Set aside the items that you need during the first four to five days of your wisdom tooth extraction recovery in one location on a dresser, table or cart so that you can find them easily when you’re too unfocused and tired to go searching your home. Things that you might place at your station include medicines, gauze, cold compresses, comfortable clothing, a trash can, tissues and entertainment items. Don’t put teabags on your list or station. Oral surgeons often recommend biting down on tea bags instead of gauze a few hours after surgery because tea contains compounds that clot blood. The problem is that open wounds become infected depending on many factors, including the quality of the tea and bag material. If you have a dysfunctional immune system or even slight allergies, your body might also overreact to the exposure and cause additional swelling followed by more pain. 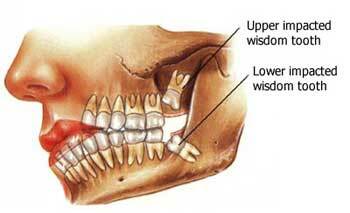 Wisdom teeth removal recovery doesn’t have to be a miserable experience. Your family dentist in Monroe can help you with these and other tips.